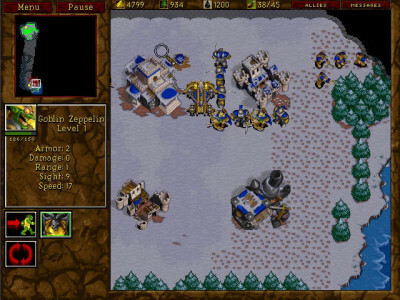 All of these problems have been fixed by the release of a new ddraw patch specifically for Warcraft 2! You can read how to install it here. This fix will eventually be included in future versions of War2Combat. The old article with descriptions of various glitches fixed by the ddraw patch follows. Depending on your version of Windows you may encounter some display glitches when connecting to War2.ru. This article provides an overview of the most common problems. 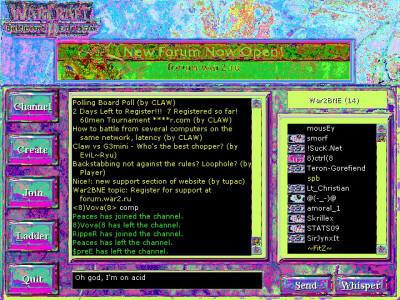 The colors of the chat lobby background images become skewed giving a mutlicolored / rainbow / technicolor / acid flashback effect. The issue affects the chat lobby only and resolves once you create or join a game. 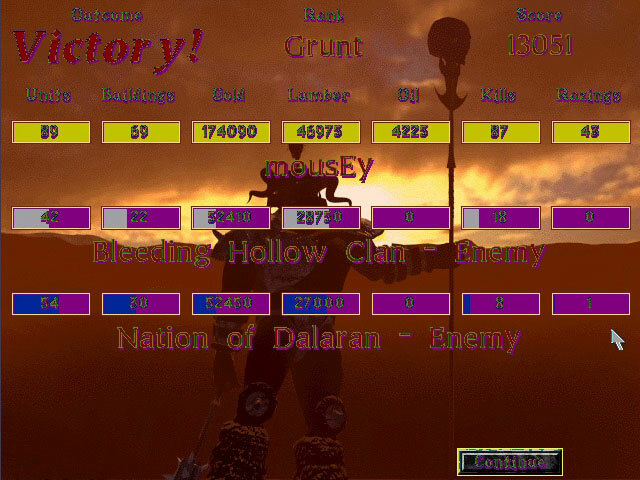 This is an issue related to the (old) ddraw patch included in War2Combat that happens when you Alt+tab to the desktop and back. One known workaround is to use Task Manager to end the explorer.exe process before starting Warcraft II. You can also use the “Win7 Colorfix” utility available on the Downloads page to do the same thing automatically. 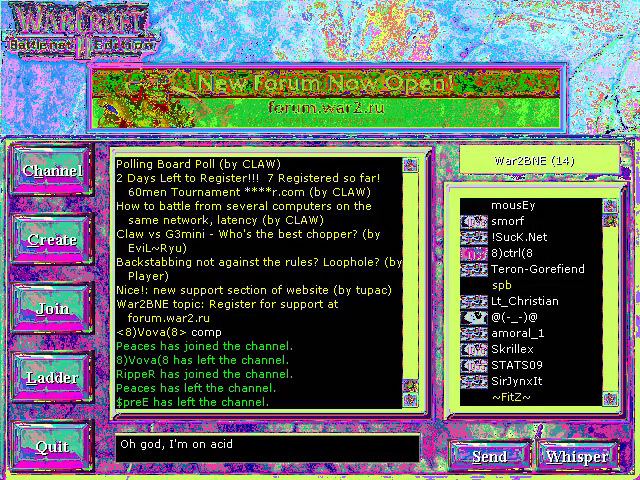 The send message box, chat window and player list all have solid white backgrounds, plus a few other minor visual distortions. Usually happens after Alt+tabbing. This problem occurs as the result of having rotating ad banners installed in PvPGN. 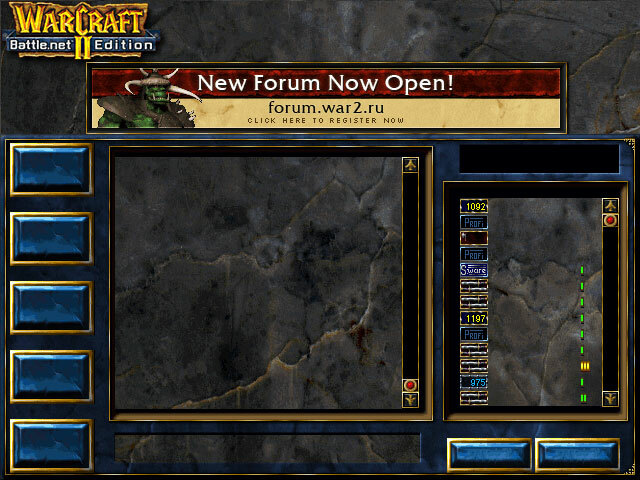 Currently server.war2.ru has a static ad banner so you should not encounter this problem. 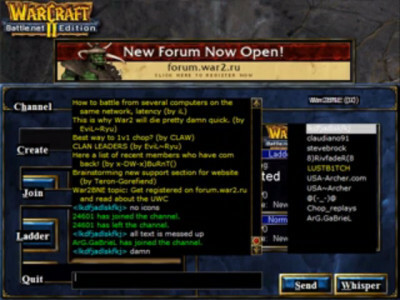 When attempting to capture a screenshot of the chat lobby, the chat window, buttons, player list and other areas are blank/missing text. This is a known issue caused by the (old) ddraw patch included in War2Combat and has no known workaround. When navigating around the chat lobby windows & text fields appear to overlap one another. Buttons & other text have a solid black background. This glitch happens sometimes in newer versions of Windows (8 & 10). There is no known solution at this time. The unit color of your opponents is displayed incorrectly on the mini map. In the screenshot to the right you can see blue appears red. Another example can be seen here. 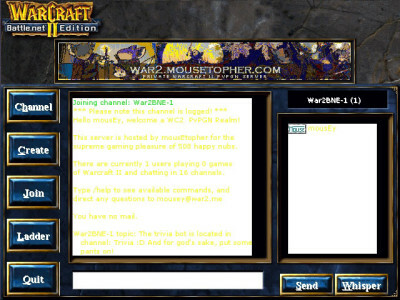 This probem occurs in old versions of Warcraft 2 including Battle.net edition and previous versions of War2Combat. It has been corrected by the (old) ddraw patch included in the latest version of War2Combat. When playing a game the player that would normally have the unit color black appears to be pink instead. This isn’t a bug — “Black to Pink” is a feature built into War2Combat since v3.15 because pink > black, and also because black is difficult to see on the mini map with the forest tileset. It is a selectable option when installing War2Combat; if you’d like to remove it simply rerun the installer and uncheck the “Black to Pink” option. Game dont have music ?? When i try to connect to the server the half of my screen is showing my windows desktop. How can i fix this? Hi Paradox, I’m unfamiliar with that bug — try posting on our forum in the support section and someone may be able to help you with it (please include what operating system you’re using). Is the registration option fixed? Because the last time i played was around 2 years ago. I am running on Windows 10 64bit (back in the days on windows 7 without any problems). I also cannot take a screenshot of the error for some reason, it just shows a square window of my desktop (like its transparant). Really annoying, can’t see anything.. Yes, it’s a new forum. I don’t know much about Win10 but war2combat does run fine on it for most people aside from the glitches in the lobby shown above, which are fixed by the new ddraw patch. This sounds like something else, maybe related to your particular graphics card/drivers, not really sure. Posting at the forum is probably your best bet for getting help with it, sorry for the trouble! Has there been any fixes for the “Various display glitches in Chat lobby on Windows 8 &10” section in the last couple years? I noticed this was posted in 2015, and I am crossing my fingers, hoping that there may be a fix now. Yes, please see the notice at the top of the post in the box w/ the green left border. Anyone know a fix for “cannot write scenario file”. Happens when I try to play in someones lobby on a map I don’t have. buttons, player list and other areas are blank/missing text. my screen is split in half top and bottom with a black line in the middle win7 intel graphics driver. chaning every settin made no difference. draw.dll new version. Has anyone had a display issue where the screen seems to be slightly zoomed in while in fullscreen? I can’t see the resources or half of the menu and whatever the button next to menu is. it’s cut off. I guess I wouldn’t really care as I can still select the buttons, but I need the resource numbers…..
Windows 7, 1920×1080, dvi to hdmi cable.